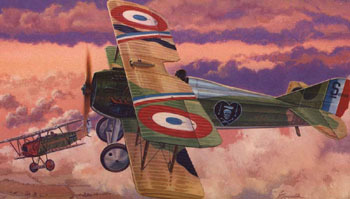 WWI French-built single-bay pursuit aircraft. 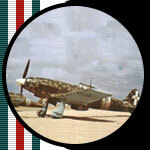 Kit has separately molded exhaust manifolds, cockpit consists of pilot and seat, irregular ground base and mechanic figure. 2 vintage mold kits of ships that are attributed with sailing to pre-Columbian America: Viking Longboat (Norse explorer Leif Ericson, 1001 AD) features 1-piece full hull with separate single-piece deck insert, single piece shield/oar banks, billowing injection-molded sail and display cradle - approximately 3.5" long. 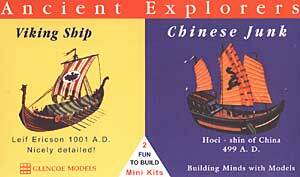 Chinese Junk (Buddhist priest Hoei-Shin, 499 AD) has 2-piece full hull with separate single-piece deck insert, 3 masts with billowing injection-molded sails, side galleries and display cradle - approximately 2.7" long.